The lady who was unknown to the masses till 1997-1998 become so popular among the people that she led her party to two consecutive historic win in the country many people believed not belonged to her. 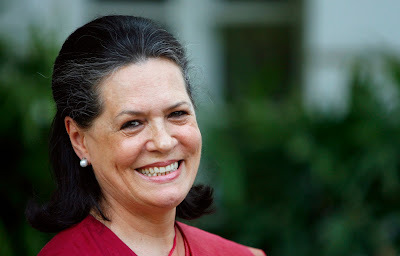 I am talking about Sonia Gandhi the outgoing president of Indian National Congress. She has left her post for elevation of her son Rahul Gandhi as the Congress party president. Her timing to enter politics collides with the time I started following politics. It was the time Indian politics was in turmoil as the country has faced three general elections in a period of four years. Her own party which she refused to join after the death of her husband in 1991 was also at breaking point with many fractions emerging from it as the opposition for then party president Sitaram Kesri grew stronger. She joined the party after pressure from senior Congress leaders and for some other reasons best known to her. Her joining and elevation as party president resulted in Sharad Pawar, P.A.Sangma and Tareeq Anwar leaving the party to form a new one on the issue of her foreign origin. This issue remained burning topic during her first election and after many more years after that. He enjoys backlashes on her foreign origin from many even today when he completely left her country in 1983 and adorned the Indian culture from her heart. I have seen the time of her elevation from leader of opposition against Atal Bihari Vajpayee government to the position of verge of electing Prime Minister of the country. She humbly refused to be PM of the country and gave Manmohan Singh the chance to become so who did it twice in 2004 & 2009. To step down from the post of becoming PM is her masterstroke to silence all her critics who used to say that she joined the party for that purpose. It also subside the issue of her foreign origin as the opposition shouted against the PM of a person of foreign origin. She by sacrificing the PM post silenced them for always. She remained the powerful women of the country in all the years she was active. Despite many allegations of corruption and slur of Bofors and National Herald Case on her career she remained strong. She was behind the ideas of promoting MNREGA, Food Security Act, Land Acquisition Bill, NSA, Foerst Act, Direct Benefit Transfer, AADHAR and many other schemes and programs of Manmohan Singh era. She feels now that it’s time for her to retire but her party wants her to remain their guardian for as long as she can. She remain active or not but India and Indian politics can never forget her contribution to the country in these 19 years she was active in politics. She was the part of change India experienced in these years. Love her, hate her but you can't ignore her. Like it or not, Sonia Gandhi has played a significant part in Indian politics and led the Congress into two electoral victory. Of course, we can discuss or argue at length on her political career, highs and low not free from controversies but we cannot obscure facts that she learned the job on the floor. Indeed Sonia had a tough time in politics. If she was not a strong woman she would have quit politics long ago.